BLACKBURN, Scotland (CNN) -- Streamers still line the streets of Susan Boyle's hometown, where the international singing sensation's second-place finish in "Britain's Got Talent" left those who know her best feeling crushed -- but also hopeful. 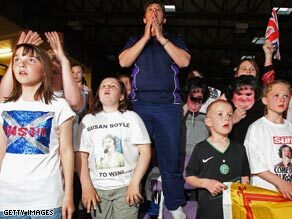 Supporters in Susan Boyle's hometown, Blackburn, Scotland, watch the finals of "Britain's Got Talent." "I am disappointed for Susan," said one of about 200 residents of the small town who turned out for a viewing party at a community center Saturday night. "But this is just the beginning of her career." Boyle's runner-up finish was anticlimactic for millions of viewers worldwide, who were looking for a Hollywood ending. When the unknown 48-year-old first stepped up to the microphone on the program six weeks ago, she stunned viewers. Her song quickly became one of the most watched videos on YouTube. Saturday night's performance was a nail-biter for Boyle's fans. In the community center in Blackburn, hearts were pounding as the results came in -- and collectively dropped as victory fell from her grasp. The British viewers who called in their votes selected Diversity, a dance troupe from East London and Essex, over Boyle -- meaning they will perform for the queen. Margaret Miller, who lives across the street from Boyle and has known her since she was a baby, said she was sad for her. But when asked about reports that Boyle could be on track to earn millions, Miller replied, "Good for her, 'cause they were a hardworking family. There were nine children and had lovely parents, lovely mother -- she was a gem." Miller added that by performing on a national stage, Boyle had made her mother's dream for her come true. "It was a pity her mum died before all this," Miller said. Newspapers predict Boyle could earn millions with a recording contract, a book deal, and perhaps a movie about her life. There's talk about possible performances in London's West End. In July, Boyle is scheduled to record an album with the Czech National Symphony Orchestra. And back in her hometown, where so many are excited about the chance to celebrate a woman who touched the hearts of people all over the world, Boyle's many opportunities are cause for celebration. She may not have won the talent show, but from humble beginnings in Blackburn, a star has been born.